Contrary to popular belief, breast cancer is not one disease – it is an umbrella term used for many different diseases, according to HER2 Support Group. HER2-positive breast cancer is a particularly aggressive type that forms when there is an over-expression of the HER2 gene. Not only does HER2-positive breast cancer grow rapidly, but it is often associated with a poor prognosis and high recurrence rates. Although successful treatments have been designed to target the HER2 gene in particular, research reports that they do not garner a response from everyone. As we know, cannabis has shown promise in treating a wide variety of cancers, and a Japanese studyfound cannabinoids to inhibit tumor growth. 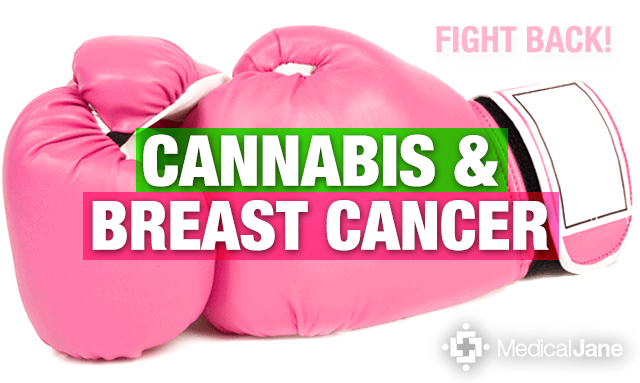 Accordingly, breast cancer research has turned to medical marijuana for answers. In 2010, a team of Spanish researchers published a study in the journal Molecular Cancerwith the intent to “determine whether cannabinoids might constitute a new therapeutic tool” in the treatment of HER2-positive breast cancer. They analyzed the anti-tumor potential of tetrahydrocannabinol (THC) and a synthetic cannabinoid with similar effects to cannabidiol (CBD). In order to analyze each cannabinoid’s potential, the researchers investigated their effects on mice with a similar form of cancer – the Mouse Mammary Tumor Virus. In addition to mouse trials, the researchers examined the effects of cannabis on 87 human breast tumors. According to the study’s results, THC and CBD had a number of anti-cancer benefits in mice. Both cannabinoids investigated were found to inhibit cancer growth, reduce the number of tumors, and reduce the number and/or severity of metastases (secondary tumors in the lungs). In studying the human cancer tissue, the researchers found that cannabinoids may inhibit cell proliferation and induce programmed cell death, or aptosis. According to the study, cannabinoids also seem to “impair tumor angiogenesis,” which allows tumors to receive more nutrients by causing blood vessels to grow. One of the most pertinent findings, according to the study, is that 91% of HER2-positive tumors actively express CB2 receptors. As we know, both THC and CBD interact with CB2 receptors, and this could explain their interaction with breast cancer. More research will be necessary before determining whether medical marijuana is an effective form of breast cancer treatment, but the results of the Spanish study are intriguing. Cannabis is currently used to counter nausea and other side effects of chemotherapy, but evidence of its anti-cancer potential is growing. If scientifically proven to treat HER2-positive breast cancer, medical marijuana may replace chemotherapy as a follow-up to surgery.